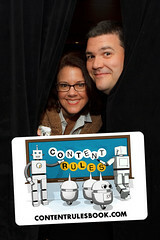 My friend Ann Handley - pictured here with Content Rules: How to Create Killer Blogs, Podcasts, Videos, Ebooks, Webinars (and More) That Engage Customers and Ignite Your Business co-author CC Chapman - defines content as "a broad term that refers to anything created and uploaded to a web site: the words, images, tools, or other things that reside there." Content attracts, engages, informs and educates. It tells your story and connects customers to you. It enables you to address the questions and concerns that potential customers have by offering solutions. With content you build relationships and solve customers problems, you build trust and establish credibility and pave the way for converting visitors to leads and eventually buyers. Given my marketing experience with non-high-tech categories, I like to stretch the definition of content to include non-digital assets. For example, the merchandise in a store, carpet samples in a showroom, print-based brochures. And, then, I like to figure out how to translate those analog assets into digital content assets and extend the marketing viability of those tools considerably online. Content marketing focuses on publishing delicious, relevant, valuable content online to attract and eduate customers and build longterm relationships with them. It tells engaging stories about you and what you offer customers. Content marketing helps you get found online. Here's how Robert Rose describes content marketing in What Content Marketing is Really About from the Content Marketing Institute. I love 'uncovering' content ideas! Every company and person I've encountered have stories to tell and, yet, most haven't - for lack of the right opportunities and tools. Given the online focus on fresh, relevant and engaging content, there's never been a better time to create content for marketing one's business online. Start by translating offline materials into online ones and sharing the voices and stories of your organization. Here are content ideas worth exploring: How Do I Create Content? You might also enjoy How To Think Like a Content Marketer. That's my take on content and content marketing. What is content from your perspective? What about content marketing? What types of content do you use to tell your stories? Which have been most effective? Image Credit: Content Rules originally uploaded by teamstickergiant on Flickr.